With the title Lyonel Feininger: comics, toys, drawings and paintings, the Museu Fundación Juan March is presenting a carefully chosen selection of works by Lyonel Feininger (1871-1956), one of the most unique figures within the early international avant-gardes. Feininger was born in New York but his parents, both musicians of German origin, sent him to Hamburg at the age of sixteen to complete his musical training. This dual German-American background would leave a permanent mark on his life and work. In Germany, Feininger decided to devote himself to art and focused on the emerging fi eld of comics, and his cartoons and comic strips were soon published in German and French magazines such as Ulk [Joke], Lustige Blätter [Funny Pages] and Le Témoin [The Witness]. 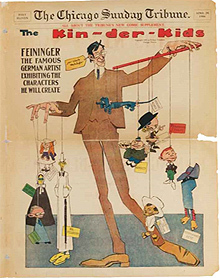 In 1906, shortly before he moved to Paris, Feininger signed a contract with The Chicago Sunday Tribune, for which he created The Kin-der-Kids and Wee Willie Winkie's World, which can be considered among the earliest examples of universal comics. 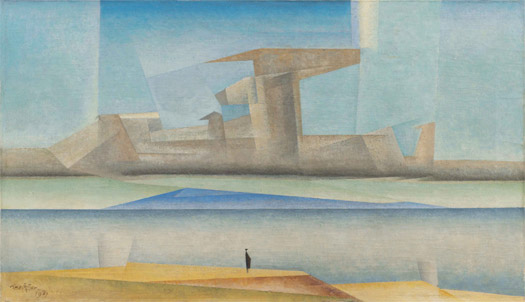 In a natural, progressive manner, however, Feininger began to move away from comics in favour of painting. While his earliest works maintain links with comic design, depicting street scenes and exaggerated characters, between 1906 and 1908 he started to make use of a more abstract line, almost completely abandoning figures and adopting a language based on straight lines and fragmented planes of colour; a type of Expressionist Cubism, both figurative and prismatic and with Romantic and magical aspects, which would become one of his signature traits. In 1919 Walter Gropius invited Feininger (together with Klee, Kandinsky and other artists) to join the Bauhaus and direct the printmaking studio, where he taught until the school was closed down by the National Socialist authorities in 1932. This experience led the artist to fully explore his use of the technique of woodcut, allowing him to develop the interaction of spatial planes in his paintings. Following the rise to power of the Nazi regime Feininger's work was classed as "degenerate" and in 1937 he decided to return to the United States where he lived until his death in 1956. Lyonel Feininger: comics, toys, drawings and paintings offers a "concentrated retrospective" of the artist's career, featuring around 100 works which encompass all the different media in which Feininger worked and the principal motifs and subjects that appear in his oeuvre: urban figures and characters, buildings, ships and trains, as well as landscapes and marine views.